Child friendly, beautiful apartment block "Diana", built in 1994, surrounded by trees and meadows. In the resort, 500 m from the centre, in a quiet, sunny position, located by a road. For shared use: garden, lawn for sunbathing. Children's playground (slide, swing, sandbox). In the house: lift, storage room for bicycles, storage room for skis, central heating system, washing machine, tumble dryer (for shared use, extra). Parking at the house. 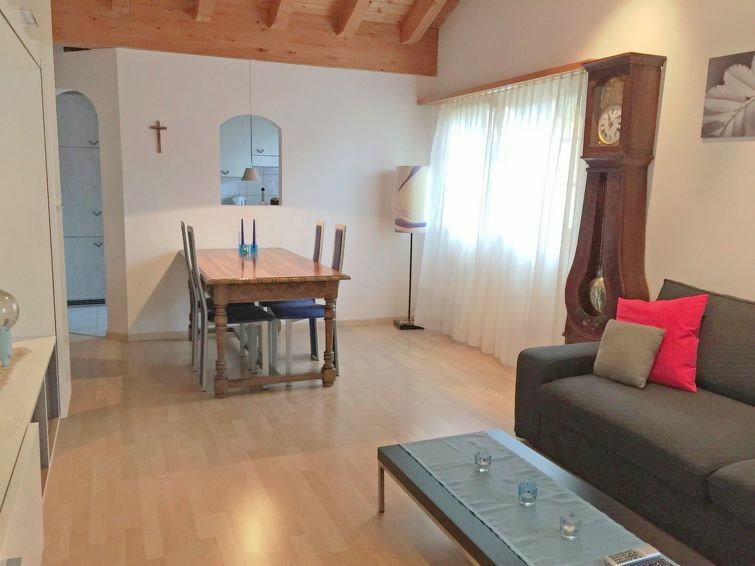 Shop, grocery 300 m, restaurant 100 m, railway station "Münster" 200 m. Walking paths from the house 50 m, skisport facilities 1 km, cross country ski track 50 m.
2-room apartment 55 m2 on 3rd floor. Comfortable and cosy furnishings: living/dining room with 1 sofabed, satellite TV, flat screen and hi-fi system. Exit to the balcony. 1 double bedroom with 1 double bed. Exit to the balcony. Open kitchen (oven, 4 ceramic glass hob hotplates, microwave, electric coffee machine, Capsules for coffee machine (Nespresso) extra, raclette grill, fondue Set (chinoise, cheese)). Bath/WC. Balcony. Terrace furniture, deck chairs (1). Very beautiful view of the mountains and the countryside. Facilities: Internet (WiFi, free). Please note: non-smokers only.